Angular, modern, and stuffed with electronics, Lexus has brought into the world a crossover utility vehicle that is designed for the modern family. An exclusive extended test of this newest Lexus was enough for us to note that this all new model is comforting, quiet riding, and sharp looking, both literally and figuratively. Smitten, you bet. And reinforcing that glowing feeling was the fact that the NX is probably going to be priced well under $40,000 and the hybrid about three grand more. Look for the Luxury package and shipping to add another five thousand to the total. Look for exceptional residual values. The NX’s forte is not acceleration, although the F Sport model is a temptress within limits. The NX also lacks the cargo capacity of some competitors in its niche. What it does offer is exceptional fuel mileage, a plethora of safety features, room for five, and an interior and electronics that are worldclass. Mom’s view: The crossover segment is crowded with some attractive competition from the BMW X3, Audi Q5, and Mercedes-Benz GLK, but in reality the NX pricing, unique attributes, and legacy are going to make it difficult to ignore for those shoppers looking for the next best thing. It does lack the interior space of some competitors. 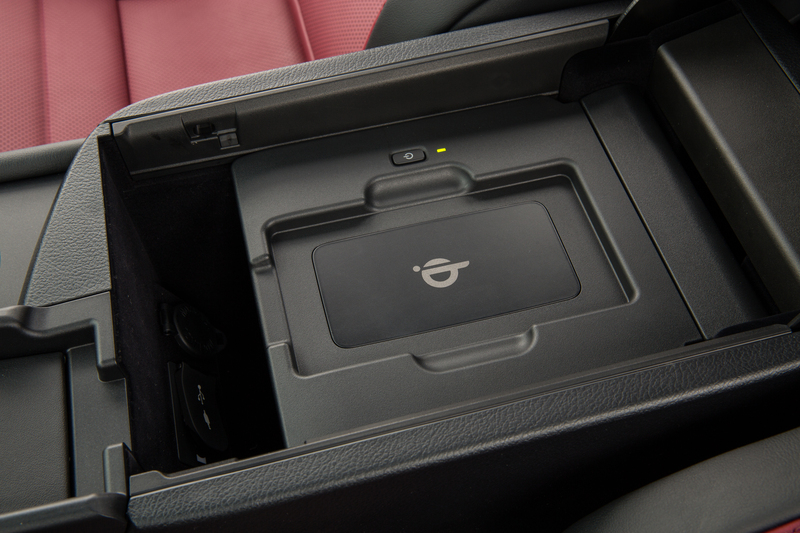 For example, the new model hasn’t much room for a purse as the center console is given over to some crafty new electronics. As in the older RX, the rear seats still recline, but the cargo space is smallish. Standard safety features include eight airbags, a backup camera, anti lock brakes and an electronic stability system. Optional parking sensors, blind spot, lane departure, and collision warning systems. The latter that can be ordered with adaptive cruise control that apply the brakes automatically in dangerous situations. If you like the exterior styling and enjoy a utility vehicle that is fun to drive safely, get in line at your Lexus dealer. This is a winner and a looker in red. Dad’s view: The NX isn’t for those who lust after 0 to 60 mph times. This is a vehicle for those who want to brag about resale value, gas mileage, and electronics. The driver can select from Eco, Normal and Sport modes that control the acceleration of the NX. 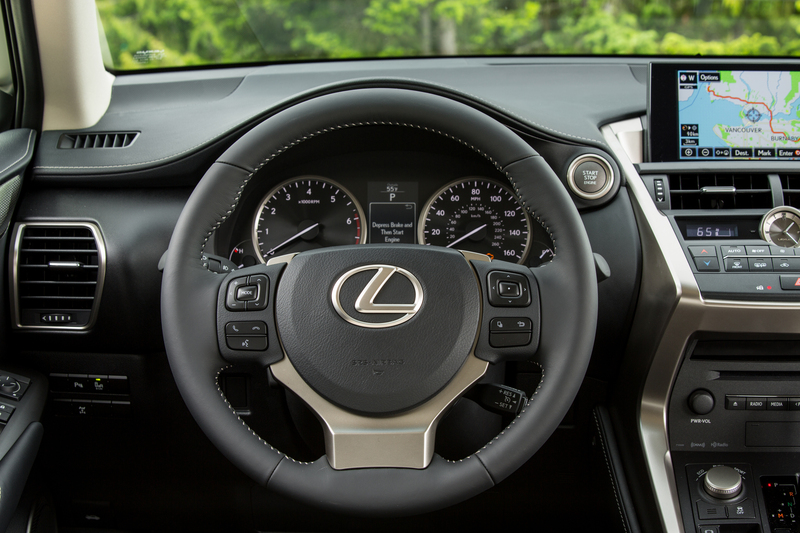 You are going to love the Sport mode as it makes the Lexus must more responsive. The NX may not be the fastest, but the fuel efficiency numbers are going to sooth those wounds with an overall average of 28 mpg for the new four cylinder turbocharged engine on premium and perhaps 30 for the hybrid, with 33 mpg a possibility in town driving. The 2.5-liter gasoline engine is paired with an electric motor to make a reported 194-hp in the hybrid. It is the slowest NX, but the most efficient. The F Sport being the stop light braggart and includes a tighter suspension and is ideal for those who drive in the mountains. We were testing the prototype and so there might be some changes, but the look and feel of the car are solid. You can expect to see these crowding the shopping malls starting later this year. Young unemployed male’s view: So much for a degree in computers, anyway, the NX offers some trick technology that includes a touch interface that enables you to control several vehicle features including driver information, station and selection read-outs, and even traffic updates. However, the GPS map wasn’t very clear on the prototype and you can’t enter a destination when the car is in motion. The HD stereo with AM/FM, satellite radio, Bluetooth audio streaming, and cleverly hidden USB/iPod connections among a host of other gadgets that provide clean sound. The cream is the optional wireless smartphone charger and the Enform information. With some models there are extra speakers, including a subwoofer, and streaming apps. The stereo is quite good and you can always download my music to lighten up your day at https://itunes.apple.com/us/album/the-ep/id44996447 The NX is a real bargain, but the option packages might push the price above the larger RX model so shop carefully. Young working woman’s view: This is a dramatically different Lexus designed to appeal to young families. It rides smoothly and yet is alert to critical situations and can even act for you. The interior is understated and draws raves for its quality materials. The seats are comfortable and the instruments well placed. The downside was the smallish monitor, about six inches, and poor graphics. I doubt that weakness will be on the finished model. The cabin is a bit dark and visibility to the rear is limited so the back-up camera is a strong consideration. The NX is easy to get into and provides a stellar view of the road. Mom’s right, gorgeous in red. You can bet the farm that Lexus has another hit on its hands with this handier sized RX. It is very pleasant to drive, provides good visibility and safety features, and provides the owner with a sense of pride. Look for early adopters to line-up Apple Store style for this next best product.